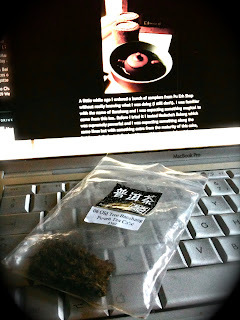 Another sample of mine from Pu Erh shop. This time it's a Banzhang from 2006, well.. 40% of it is, the other 60% is Bulang. It's supposed to be a close match to the 2003 Spring Banzhang cake I sampled yesterday so I thought it would be an ideal time to try it. First up, what do you do when the remaining size of your sample is too much for one brew but only just? I seem to always be left with an amount too small for another session, most frustrating! I left the 'chunk' in the bag (pictured above) as it's compression was too tight to separate with my cha dao 茶刀. First impressions, it was a lot darker than I expected, had I used too much tea this time? The pictures on Pu Erh Shop's website confirmed the colour though. The soup was thick and it's main characteristic was the taste of burnt dark sugar. 2nd infusion less so but it didn't have a second flavour to replace the sweetness. 3rd infusion, this is more like it. A little bitterness at last with a slight numbing of the tongue. I've rushed though this infusion so I can get to my fourth, I'm starting to become intrigued. 4th infusion, it has lost its sugar and is now tasting more like the 2003. The effect on the tongue is more pronounced and far more energetic in general across the mouth. It's at this point I'm going to stop 'trying' to analyze the tea. It's time to clear my mind and get on with the days doings. Is it a close match to the 2003 at one 1/3 of the price? I preferred the 2003 as it was tasted more refined and didn't go through an awkward first stage of being nothing but caramel. It does, however, become a lot closer after a while. It's a $25 cake compared to $99, that's a big difference in price! Again, I ask myself, is the better cake worth almost four times the cost? No, but it is better. Side note for today, I've stumbled across another place in London to drink tea for myself to investigate. Prices for decent teas start at £10 with the first few infusions being performed by a member of staff in a gaiwan. I must take a closer look.... watch this space. Dried leaves are on the ground and the air is crisp, Autumn is coming and it's not hanging about. My local park is starting to become endowed with a veneer of yellow and brown. The season of the Summer is in it's final throws and most of the berries have gone. Classically the colour of Autumn is white. The casual observer may associate this season with the amber and browns of the leaves with white being that of snow, a Winter affair. To me, the colour appears in the sky and the hue that casts on the earth beneath. The skies are like a sheet of white and there is clarity and definition. Precision is manifest. The air clears your lungs but don't breath too deeply for the dryness of the atmosphere may be too harsh. Moving onto this morning I am tired. I have worked long hours over the week and I was looking forward to just resting today. My mood was lethargic. Something drew me towards giving this sample another spin. What would I detect in this brew second time around? 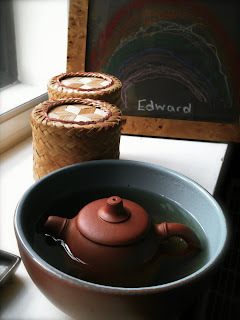 The yixing pot was warmed up, the leaves rinsed and then steeped with some mineral water. The decanted soup was a lovely rich colour, not too dark and murky and also not that fake tan orange much beloved of body builders and the self conscious members of the British public. I'm not going to search for words to describe it unless something aspect of its flavour really jumps out at me. I am in the frame of mind to just enjoying the moment for what it is instead of muddling my thoughts with the correct terms for what I am experiencing. The flavour reminds me of aged pu erh, the earthy flavours of Hong Kong. It really starts to taste what I remember 香港 bolei was all about. It's not overpowering but strikes me as a nice relaxing, enjoyable, subtle earth. My stomach gurgles when it receives the brew. Something is going on in there but I feel it is beneficial. My conclusion? Easy to drink but it doesn't excite me. The flavours don't overpower me and my thoughts on other subjects come first. Perhaps I should use more leaf? But alas my sample is finished and at $99 a cake I won't be investing in more. My tastes are too unrefined to spend big bucks on a cake that I honestly can't decide upon. The way forward is to keep trying samples everyday to build up my experience. Thoughts on my tea shop.. Although looking authentic, perhaps all wooden Chinese furniture will be too hard for my customers to relax. The aura and feel of my shop should encourage my guests to stay and relax. The surroundings inspiring and comfortable. An oasis for tea inspired thought that allows you to melt into its very existence. Just added the very last of the leaf to the pot and brewed it. It's darker still and earthier with a liquorice taste. All of a sudden I was hit the the huigan like a dark, sweet candy, lingering nice and long. I feel compelled to brew another cup.. I want another hit! Silly me, not enough leaf. Thoughts and Teapigs Mao Feng..
Well the search is on. Looking forward to my plan of opening my own herbal apothecary, tea shop and clinic, I am looking through teas to have an idea of what to offer. What level of tea should I offer? Is my plan to be more of a tea merchant offering the finest teas or on the other hand be more of a tea shop offering lower grade teas? I think the best thing is to offer a selection a bit above a company like Teapigs so the casual customer would be catered for instead of the expert as such a person would really look at more direct sourcing for teas online. I'm sort of envisaging clear glass pots so people can see the leaves and be curious in them, tea tables and posters on the wall providing information on each tea. These posters can be shrunk down as well to make up the bulk of the menu. But where to source the tea? Obviously each step marks the price up so I should try to source as close to China as possible. Supply will be an issue. People will be served each tea in shop and then also have the chance to buy it loose to take home. Today I'm drinking various loose teas from Teapigs to decided whether that level of tea is good enough in my mind to be sold in my shop. So it's teas in the region of £4 per 50 grams, but just how good a tea can I get for that sort of price? Let's start with Teapigs as it's to hand and then compare it to online sourced teas in a similar price bracket from China. Just a small amount of research gives me shocking results. Teapigs Mao Feng looks dry, dark and fragmented. After brewing it's reasonably green and it's a reasonable but average cup. Mao Feng is called 'fur peak' in English and there is no fur on this tea, it almost looks fermented when loose. Compare that to tea directly from China which is green and furred, well.. I'm am expecting a big difference in taste. The proof is in the pudding though! I shall be ordering a low grade tea and see how it fares. It's going to be fascinating finding out!!!! Sounds like a 1970's kung fu flick in the title! I was kind of naffed off yesterday by drinking some tea whilst my seven year old son ran riot in the house, what a mistake! Instead of enjoying my tea and relaxing I seemed to spend my time 'trying' to enjoy my tea and becoming agitated by the distraction. Not healthy for me or beneficial to my son. This morning I have had a chance to do some drinking in solitude and enjoy my brews. Is it pure chance that my tea tastes just so much better today? I started with a strong favourite of mine, the American Hao 0904 by Pu Erh Shop. It's such a nice tea and very green, just how I like it. I just love it but I'm not sure I love it enough to pay the $46 asking price (plus postage!). Is it $36 better than the 0901? Or 4.6 times better? hmmm... Love it though! I thought I'd try another tea of mine too, one that didn't capture my imagination like my Nadacha samples, Banzhang teas or American Hao's. I wasn't expecting much from it but it also was a nice tipple. Older and darker, more rounded and more reminiscent of my original perception of Pu Erh. I lack the vocabulary to describe my experiences yet. If I pick up a taste I'll just say it straight, like leather, grass, plum, apricot and even beetroot! More important though is that I enjoy my tea drinking and this morning was just such a thing. Lesson learnt, drink tea when you are able to enjoy it without distraction! One of my more recent discoveries is that of pu erh tea. I grew up drinking dark, earthy ripe pu erh in Hong Kong and little did I realise that there is a whole world of interesting pu erhs that are as different as night and day. This particular tea was bought as a sample from a nice man and tea enthusiast called 'Nada' and was picked in 2009 on his journey to Yunnan province. This tea comes from the Bulang region which is famous for producing teas with a strong bitter character and this tea is extremely bitter to my tastes. If I am honest I do struggle with it as it's 苦 kŭ, it's just too much and after 3 or 4 infusions I'm starting to run for cover! Perhaps this is the sort of tea that will mellow after being stored for a while? One thing is for sure, it's a great tea to compare to sweeter pu erhs to demonstrate just how different they can be. I've tried hard with this tea all day today and must be on my 15th infusion but I can't really bring myself to like it. I'm living in fear now as I have a 2007 spring tips Bulang bing in my cupboard, I'm praying its not as knockout as this tea! **edit later on** The 2007 spring tips is far from knock out..
Just going through points in my head I struggled to recall what was the element association of this point. I had forgotten the simple sheng 生 cycle of the points. As its a yang meridian the most distal point starts as a jīn 金 metal point. Following the 生 cycle the next point is 水， then 木, then 原 source, 火 and the sixth point of the Small Intestine meridian is an accumulation point. SI7 is the junction point with last of the command point being 土.